If you've recently purchased an urban apartment, chances are that unless you're making the big bucks, you're probably a bit short on space. With this in mind, there are a number of design avenues you should consider before remodeling, and a new bathroom vanity should be at the top of your list. Unless you're using the area underneath your sink for a large amount of storage, this area is simply a waste of space. Consider installing a floating bathroom vanity - a sink and a few drawers are included and it will drill directly into the wall. 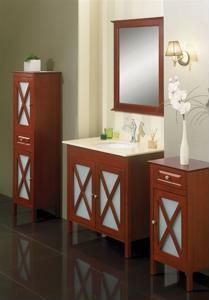 This can help to save space drastically and can give your bathroom a modern touch. A floating bathroom vanity can also help you keep your bathroom much cleaner, and there will be less nooks and crannies for dust and grime to build up. You can also add some side shelves or a small medicine cabinet next to the sink to improve your storage without eliminating floor space. An apartment comes with its own set of daunting design challenges, but putting a premium on saving space can drastically improve the flow and appearance of your bathroom.